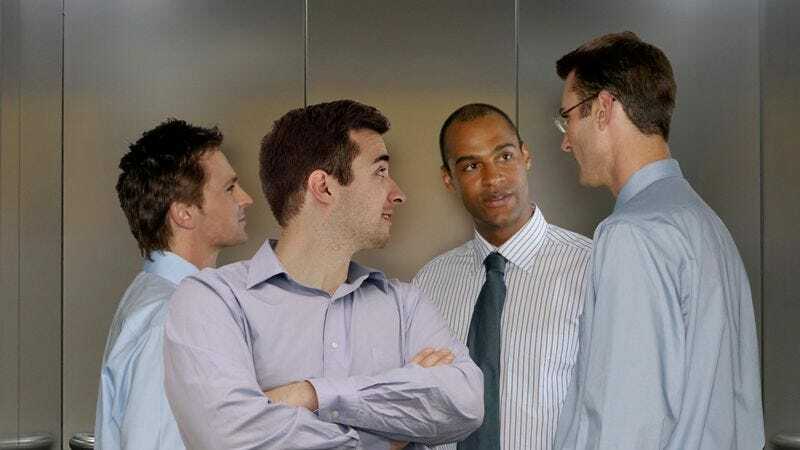 CHICAGO—Following the unprompted remarks he made over his shoulder, an unidentified man currently riding the elevator with Regent Business Solutions coworkers Joseph Roper and Adam McIntosh is apparently now in on the conversation, sources confirmed Monday. “Oh, Western Barbecue? I went there last week, actually. Great place,” said the anonymous individual, who is now, evidently, an active participant in the dialogue, and who will continue to offer his thoughts and reactions throughout the discourse until the elevator reaches Regent’s offices on the seventh floor. “You’ve gotta try the brisket. Best in the city, if you ask me.” At press time, after Roper and McIntosh had exited at their floor, the unnamed man was seen pressing the button to hold the elevator door open while relaying his plans for the upcoming weekend.